Cold winter days are perfect to stock up on some broths. Every other weekend I make a fresh broth to use in cooking during a week and to freeze for later (for hot summer months when just thinking of turning on the oven makes me hot!). I prefer to make my stock during weekends, uninterrupted by pick ups, drop offs, and other school activities that sometimes come on a moment notice. For the stock I use portobello mushrooms as they have a little more flavor. Preheat the oven to 350F (175 C). Prepare all ingredients (clean and cut), and place on oiled baking sheet. Roast until golden brown (about 25-30 minutes depending on your oven). Transfer all roasted vegetables to a big pot, add water and bring it to a simmer (never let your broth reach a rapid boil point!). If there is any foam, skim it with a slotted spoon. Simmer for about 3 hours. Add dill seeds and peppercorns and simmer for another 1-2 hours. Add bay leaf and simmer another 10 minutes. Cool, discard bay leaf, and refrigerate over night: let all the flavor develop and blend. Next day strain the broth, bring it to a simmer for about 15 minutes. Now it's ready to be used in your favorite risotto, soup, sauce. Shelf life in the refrigerator 3 days. I also freeze it in a freezer safe and labeled container (I personally like wide mouth jars) for up to 6 months. There's no salt in this broth as I prefer to control salt when I make a dish with it. However, from time to time I do add salt at the end and label it accordingly. Yes. I think I do. Interesting that you don't roast the celery root with the rest of the roots. The Japanese use Shiitake mushroom for stock too, and I love portobello mushrooms so I am already in love with your stock! 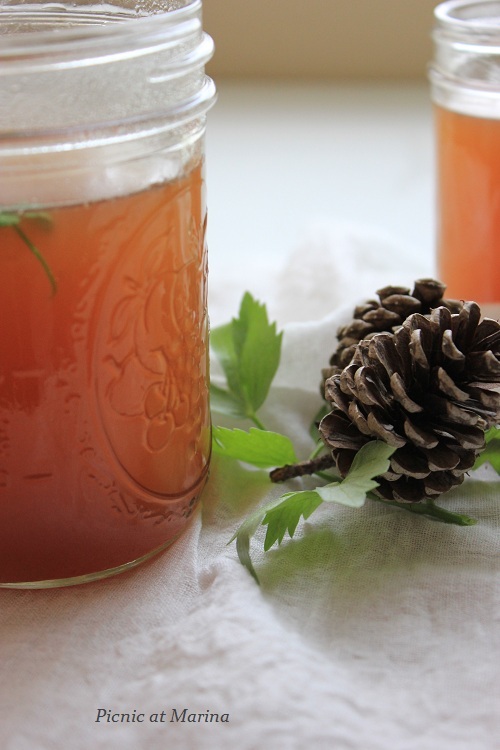 I love cooking with homemade broth (and my next post is about stock, too. What a lovely coincidence!). Hi Nami, shiitake mushrooms are a bit too strong for us, but I do use it directly in soups and other dishes mixed with porchini mushrooms. Like that you roast your veggies instead of browning them on top of the stove. I have never made a mushroom stock..thank you! Hi Jackie, what's wrong with the chicken stock? It is even easier (there's no roasting step) than mushroom. 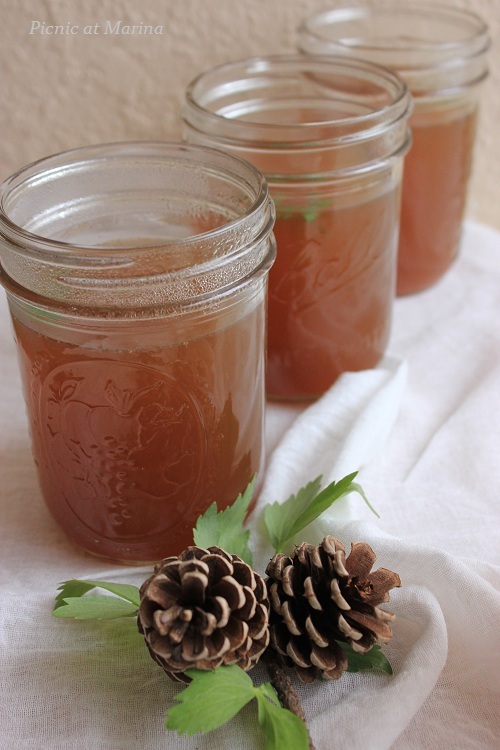 My next post is about chicken stock, come see it, may be your fear would go away. Making stocks is the easiest thing to make in the kitchen! :) I have never bought a stock in a store, strange, ha? It smells heavenly! I've never made this but it sure would be nice to have some on hand! Thanks for sharing the recipe! Hugs! Hi Lizzy, I would love to have a freezer! :) a big one! So nice to have homemade stock in the freezer. Always prepare mine too... But I never prepared mushroom stock. I will, thanks to you! I make something similar, but I just call it vegetable stock! ;-) I do add a few more veggies though (and a few more mushrooms). The mushrooms add such a great umami flavor to the stock. Sometimes I'll add just a tad of soy sauce too - we're talking maybe a teaspoon - although that adds salt. Anyway, really good stuff. I'm going to start calling mine mushroom stock too - sounds classy! Thanks for this. This would be beautiful. Imagine how nice it would be with porcini too! I would never have thought to put dill seeds in the broth...I must give that a try. Hi Karen, dill is my favorite herb and I use it heavily: we are talking in pounds, not ounces! That includes seeds and dill weed. Plus more dill during the season when we eat fresh dill with almost every meal. I even make a tea with dill seeds, chamomile and fennel seeds. With a few drops of raw honey on a scone you have a summer meadow in your mouth! :) Thank you for your comment, Karen! Thank you Charlie! Hard to forget my grandmother's words: "don't boil, simmer!" There's no secret behind it, just cook it slow. Mushroom stock has a lot of flavor. And if you have an access to a wild mushrooms, that would make the most flavorful stock ever. My mother pre-cooks wild mushrooms, then freezes it. Then she makes stock from those mushrooms as she goes. I am sure you can find wild mushrooms in Poland and make the most flavorful stock from it! I can drink plane stock made off those mushrooms! :) Thanks for stopping by, Joanna! How perfect for winter soups! Your soup sounds wonderful, Marina, and I can only imagine how good a risotto tastes when made with it. And the sauces! I bet you make some really good sauces with this. Like you, I don't salt my stocks unless I'm sure of their use. Why risk a salty dish down the road? Hi John, thank you for your kind words. You are right, sauces come out very flavorful, as anything with this stock. Because it is cooked for 5-6 hours, the flavor concentrates. This stock is the most popular in my cooking, I make it quite often. Salt is a bit tricky, yes. Unless you know the stock is salty and make careful adjustments during cooking (meaning, taste before add more salt), you can end up with salty dish. How interesting this mushroom broth...can I borrow one jar from you? 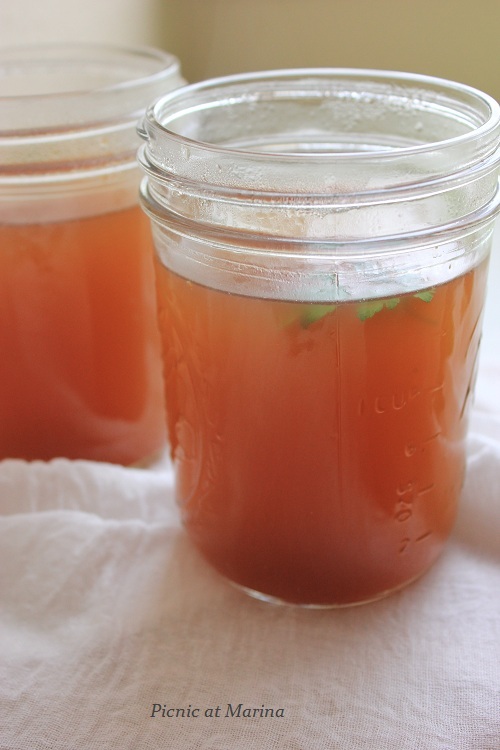 I sure can almost smell it and would love to use this broth in one of my soups. Have a wonderful week Marina! I made chicken broth today, that could help you even better: I heard it has some healing properties! :) Get well soon, and thanks for commenting!